Still psyched about Blogger's new threaded comment system? Not really? Well, here's something to boost your spirit. In the old system, I used to have a way to highlight author's comments - you know, so that my comments stand out from my readers' comments. Unfortunately, with the release of the new threaded comment system, that tutorial got obsolete. So I dug further, and came up with a way to do the same in the threaded system. As a bonus, this tweak automatically highlights non-threaded old author comments as well! This is a response to blog readers Blaine and magda. Go to Dashboard --> Template --> Backup/Restore --> Download Full Template --> Close --> Edit HTML --> Proceed --> Find for </body> --> Paste the following code directly above </body>. You're basically done. If you want to personalize the highlight's design, see some of the options I've included below. If you have a specific design in mind, and you can't achieve it with the options I've given below, feel free to leave a comment and I'll let you know if and how it can be done. 2) You can change the color to a different plain color. I've used blue in the code above. You can also use hex code for a specific color. Background You can either use a plain color or an image as your background. I've used a combination of both (white transparent image with light pink plain color). Padding I've included a padding in my code because I think without a padding, the border is too close to my comments. You can set the padding's value to 0 to see what I mean. Comment Font Color, Size and Type To adjust comment font color, size and type, refer to my previous tutorial. Thanks so much for doing this, the one thing I didn't like about the new system was losing my highlights. That was fast! You're welcome DCG, and thanks for the feedback. Thanks so much for your awesome blog, it has helped me so many times! Check out my Blog? ?It is showing in Blockquote How do I remove. Hello Yoboy I found one error.As you are Top contributer i am saying that comments are showing in form of Block quote.I found you have also same problem.Can You reply me. @Green: I'm not exactly sure what you mean, but I don't have any blockquote problem. And I don't see any blockqoute in your blog either. I see some in your posts, but not in your comments. Edit your post, and delete <blockquote> and </blockquote>. That should get rid of it. You donot encountered a problem of blockquote because you have not styled it with css. But if you inspect Setting in the chrome hovering near the comment you may find blockquote instead of paragraph. Then probably you may face problem. The comment message add comment in below of the place where we write a comments. and message "If you have a question nothing ....."
it's more than place where we write comment. I have already summitted in Blogger Help forum this is the link. Although this is related to blockquote i will shoot the question at there. Can i Recommend you something. As the comment is shown in only item pages.Can you enclose the those script with conditional tag. i.e making java script to appear only in post(item) Pages. Let's take it to the forum. Hello Yobey! See its not working althogh i strictly followed your suggestion. Thats was the good idea to hide background using blockquote.But it is not working. Although the question is answered but no things happen to me. I think threaded comment is much more buggy as i expected. Can you give more suggestions here! You are awesome!i have only found you who want to help other selflessly. Although I am new to Blogger.You had made it easy. I am financially weak i appreciate you very much that's why i have added you as friends Yoboy. Let's keep it in the forum. By the way, no, wrapping your script with conditional tag isn't gonna help your page load faster. In fact, it'll be slower. You script will get loaded anyhow, just that it won't integrated to the conditioned page. And in addition, you're gonna waste extra speed for checking that condition. Not a good idea. how if i want to add hover effect to the background? 1) First, attempt the tutorial above and make sure your comments are highlighted. Change the color yellow to other color or image as you like. Cheers. wow...thanks a lot for your kind reply! Is there anyway to change is so the name will appear on the right side? "Winnie Jan 26, 2012 04:07 AM"
"Jan 26, 2012 04:07 AM Winnie"
Isn't this what you were going for? Have you gotten it fixed? I'm referring to the line before each comment. you can see that when the name is in Hebrew it appears on the right side (as it should!) but my name appears on the left side and also the name of another follower as it is in English. I'd like them also to be on the right side - the beginning of the line (beginning for us) and not at the end. You had a tutorial which described how to prevent people from copying text from your posts. Essentially you could not highlight any text on the page. It worked wonderfully in the old template. I would like to know how do I do the same for dynamic views. I tried to locate that tutorial to place the comment there but unfortunately could not get hold of it. How to highlight comment-content only? change ".comment-block" to ".comment-content" in your code doesn't works. Hi I'm not sure why but for some reason I can't get it to work on my blog. Every time I save the code in my template, it gets somewhat distorted. 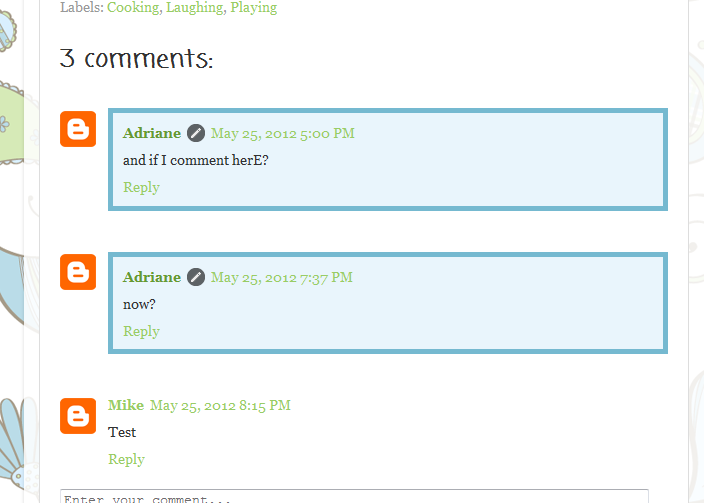 I changed my comments to the new threaded comments using method 2 stated http://www.way2blogging.org/2012/01/official-blogger-threaded-comments-is-live.html. Would appreciate any help rendered, thanks so much! 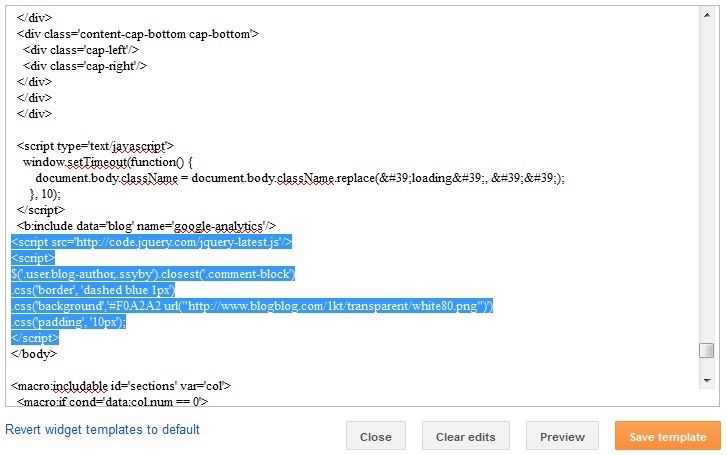 I couldnt deduce why it isn't working by inspecting your blog. I need to have a look at your template code to learn more. Here's what you can do. 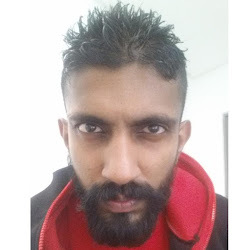 Go to Dashboard - Template - Backup/Restore - Download Full Template - Save the resulting xml file somewhere in your computer. Then go to www.rapidshare.com and upload your xml file there. You will be given a link. Come back to this thread and leave your link here. Hi, I tried it again today and it could work! I guess I did it wrong previously. One qns, do you know why the pen icon that's supposed to show up beside author's name is not showing? there's just a blank space. thanks! The QuickEdit icon will not load when the template goes idle. You can fix this by restoring your template's widgets to default. But I have to warn you that, by doing this, any direct template changes that you might have done in the past, will be undone (like the code that you added for tutorial above, it will be removed). It's kinda like 'restoring to factory settings'. What you can do it, first, backup your template (Dashboard - Template - backup/restore). Go to Layout - Post Body - Edit and make sure you quickedit icon is ticked. Next, click on Template - Edit HTML - Proceed - Restore widget templates to default. That should fix it. Thank you...super easy to implement and works great! Damn it, that was just perfect!!!!! It was so simple, just adding a relative position & z-index. T H A N K Y O U !!!!!!!!!!!!!!!!!! Exactly :) Enjoy your weekend! No prob at all bro :) Happy blogging! Good day Sir Yogaratnam N.
The codes you gave here for highlighting the author's comment didn't work in my blog, www.asiandramaportal.blogspot.com. Even changing the avatars for the comments also didn't work. Can you please check the codes of my template in order for these things to take effect. I don't know much about this though. Also,how should I let the featured content slider only appear at at the main page but not on the rest of the posts? Thank you so much for the time! I'll be waiting for your response. God Bless always. Here's the link of the template: http://www.mediafire.com/?i4v2iwel16u7m9p. It probably has something to do with the fact that you're using a third party template. In any case, can I have a look at a post that has actual comments on it? By the way, I don't see a slider in your blog. And judging from the template code you sent me, it appears the author has set the slider to only appear in indexed pages (archive, label and homepage). Here's the page where there's a comment. Hope you can help me apply this feature in my blog. It works in Dynamic Views? What should I do? I want to work also in Dynamic... but it doesn't. Any CSS? It won't work in DV at the moment. I was wondering, on my proper blog, there are other moderators or admins, and if they comment on a post that is not theirs this the highlighting does not apply. Is their a way to allow every admin's comments work on any post on the blog? Use the following code if you wanna highlight Admin comments. One set of code for each admin, duplicate as many times as you want. But there's a downside to it. Say if I choose my nickname to be 'Soggy_Doggy' and decide to leave a comment on your blog, my comment will be highlighted too, even though I am not an admin in your blog. Just so that you know. Forgot to tell you. Change the word 'yoga' in the code above to your admin's nick. This was fantastic thank-you so much ^_^. Thank you so much for this! I edited my template so much only to realise I was looking for the wrong kind of code and it was this simple! Is there away to change the the url of the link when clicking on the authors name. how could i change it to www.google.com for instance? It should highlight all authors comment. But note that though a blog can have more than 1 admin, a post can only have a single author - and this tweak highlights that author's msg. Can I have a look at your blog? thanks for the hack, it's great!! Hi, I do no know what I'm doing wrong but I can't click Edit HTML? I'm on the Template page, and while the "Customise" button is orange and clickable, the Edit HTML is greyed out and I can't click it, even though my cursor turns into a little hand when I hover over it! You're using a Dynamic View template, whereas this tutorial is for non-dynamic-view templates only. Is there something in particular you'd like to do to your Dynamic View comments? wow, thank you so much for this. very simple! I had to read all of the comments here to see if I could resolve some of my problems or get new ideas. You really work wonders. Great job! I was so excited to find your post--I've been trying to change this using the old way and wondering why on earth it wasn't working. For some reason though, when I save my template all of the single quotation marks get changed to ' and it doesn't work on my blog. I have tried deleting the changed part and putting the marks in myself but it still gets changed when I save the template. Any thoughts? Can you see the same? Yes, thank you! I copied to notepad , changed the quotes and then copied and pasted again. It still changed them in my code--but this time the comments worked!Thank you for your article and your help. I tried many times to highlight the background of my own comments and it never works... any ideas why it doesn't work at all ? Your post was published by 'L'univers de ma classe'. Thus, in this case, 'L'univers de ma classe' is the author. But I can't find a single comment from 'L'univers de ma classe'. Whose comment were you expecting to be highlighted? In other words, the author comments were not highlighted because the author did not leave any comments at all.. The very last comment of the page is a comment from "L'univers de ma classe" as an answer to another comment from "Anonyme" (this answer is slightly highlighted). Just above this other comment, there is another one from "L'univers de ma classe" (this one is not highlighted at all). I'm sorry, I'm not sure it is very clear ! I think the apostrophe is causing the problem. Just out of curiousity, when you try to reply a comment, do you reply using Google profile or do your choose 'Name/URL'? The fact that 'L'univers de ma classe' is appearing as 'L'univers de ma classe' in comments is enough to indicate something is wrong here. Just for the sake of testing, if you have another Google account, could you add that account to your blog as an author? If you don't have any, you could create one -- keep it special-characters free (no apostrophe this time).. I tried to add my other account as an author for the blog, but it doesn't seem to work either. I manage to go to the main page, but then it tells me that I have no blog (under this account). Anyway, sorry to take your time with that ! It is so confusing and frustrating ! I suppose 'Univers de ma classe' is your other/new account, yeah? That's a good start. To add an author, you need to use your 'L'univers de ma classe' account. The whole thing will be much easier if you have two different browsers open, one logged in as either account. You woulnd't have to sign in and out that way.. Right, I have added "Univers de ma classe" as an author for the blog. However, I seem to only be able to write a new message and reply to a comment. Please don't be :) I'm curious to find out what's wrong as well.. We'll get this fixed, as long as you don't give up..
You've added 'Univers de ma classe' as an author - this account has limited privileges.. But it is fine for our test purposes.. Just so that you know, you could give admin privileges to this account now by going to Dashboard - Settings - Basic - Permission.. But that won't be necessary for our tests..
WOW !!! I did exactly what you told me (I used my other account for my new article and tried to post a comment there) and it worked perfectly !!! I've also realised that now that I have posted an article with the new account, I have access to everything on the blog ! Excellent! That makes perfect sense.. In a post written by the old account, the old account is the author, and the new account is just a regular comment.. Thus it will not get highlighted.. But when the new account replies a comment on a post published by itself, the comment gets highlighted since it sees itself as the author, you get what I mean? That means you've done your steps right, and the tweak is working as expected in your blog. Sadly, due to the apostrophe in your old account, Blogger does not see the comment as an author comment even though it is indeed an author comment. There's something broken at Blogger's side, and there's nothing much we could do about it..
2) remove the apostrophe from your old account.. Remove the line that has the word 'Navbar1' from your template, and you shall not see the error message again..
As for the highlighted comment, unfortunately, there isnt a way to do it in Dynamic Views as of yet.. Thank you so much !!! It works !!! I have just changed the name of the account, without the apostrophe, and it works !!!! However, I suppose it won't work for the old comments still called "L'univers de ma classe"... there's no way to change that is there ? Excellent! As for the old comments, there isn't a way to make them work automatically.. However, you can delete them and re-comment with your new name, manually.. I can give it a shot, but since I don't know how the slider works, I can guarantee compatibility between the gadgets.. Now, where can I get a copy of your template so that I can test things? Oops, sorry but I just opened your test blog to test and seems that have the same problem than mine. Drop down works but without any effect and the slider doesnt work. It stuck always in the same image, doesnt change automatically and either can be change manually clicking the arrows. Am I missing something? Tried in firefox and chrome and both same result. I'm not sure what's causing the problem, but if I had to guess, I'd say your slider will not work if you add any external script to your template. The code to highlight author comment is very basic, and it's definitely not interfering with your slider elements. But somehow your slider stops working when an external script is added. I can think of a temporary solution for now, but I suggest you run this by the slider maker to see if there's a better solution in the long run. The drop down menu appears fine to me. What's wrong with it again? The dropdown menu doesnt work because it doesnt show even wich link are child and either have the "smooth" effect. Anyway that script seens to not highlight comments at all. You may be right and it will be messed everytime I add an external script. But is fine, thanks for trying to help, I really apreciate :) I will try to contact someone experienced and pay him to add and fix all custom things I want. Again, thank you very much for your answer, Im sure they will be very helpfull for others with similars problems. Thanks so much for this eassssssssy solution! I really appreciate it! I tried to implement you code but it did not work for me. after I add the code and save the template, the whole blog goes blank ( I see nothing but white screen!). Don't worry about the character change - it is common. It is Blogger's way to safe proof the code..
As for your page going blank, not sure what's causing that. Let me have a look. What's your blog's address? Does this work with dynamic views as well? Nope. For non-dynamic view templates only. I couldn't find the right handlers to make it possible in Dynamic View templates. thanks~finally i make it already. I am using picture window template .It's not working for me. my blog is vphotoshop.com ... Please help... waiting.. 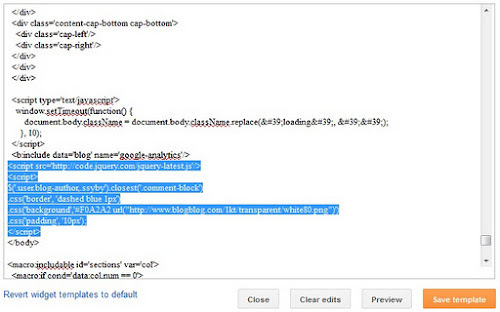 I've looked into your blog, and it doesn't seem like the code above is anywhere to be found in your template. Check again if the code is saved. Hello! I tried this on my blog but It did not work? could you please help me out! You seem to be using a customized version of simple template, with an older version of the comment system. Try the following tutorial instead. I can't guarantee that it'll work, but do give it a try. If it doesn't work, please contact the maker of your customized template. This worked. However, I still have a greyish background(default in blogger) behind the pink background for the author comments. How do I remove it? Also, how do I add an image before the comment starts(like u have your picture)? There isn't any comments in your blog. Do you have a link with an author comment that I can look into? As for the avatar, it comes with the system itself. Users who have setup their Blogger profile or Google profile will have their images next to their comments. 1. My no.of pageviews used to include my own pageviews as well. Though I've changed the setting now to not include my pageviews, how do I delete the ones that are already shown? 2. There is a small Subscribe via email link at the end of the blog post page. How do I delete that? 1. Blogger's page stat isn't exactly a state-of-the-art feature. You can't alter previously registered counts, and your current count will not be entirely accurate as well - but so is the case for most stat counters out there. 2. This link is rendered with your comment form, and there isn't a way to individually address this element without restructuring the form (which is a crazy thing). There isn't much we can do about it. Thanks for the info. However, could you please tell me how do I remove the greyish color in the comment reply box? Also, in the post that has comments, the leave a comment icon has slipped to the end of the page, how do I get it above the comment box? Looks like you're gonna have to cut a lot of code and restructure your comment part, if you were to reposition the 'Leave a Comment' image. First of all, did you add this image on your own or was it included in your template? This Tutorial is working 100% I was successfully. Thank You This step by step guide..! I did not post this tutorial for you to reproduce in your blog as one of your own, nor do I understand the need for the same tutorial to appear twice in the Internet. Please get it removed ASAP. You're welcome to use this tweak in your blog, or review my post, or link to it - but I don't appreciate anyone posting my content as if it is their own hard work. This worked perfectly in my latest post (like so) and will presumably work fine in future posts too. But I recently updated my Blogger profile to a slightly different name, and it doesn't seem to recognise my old comments as being by a blog author (even though if you click on those comments it takes you to the same, now updated, blogger profile). So those are not highlighted in pink. Here's an example. Is there a fix for this so that all my blog comments are highlighted pink, old and new? Here's how things work. When you leave a comment, your comment gets saved in the post's comment feed. Blogger will then run a query to find if any comment matches the name of the blog's author. Since older comments are saved with different names, they will not be recognized as author comments, as they don't match the current author's name in Google's server. That said, I think I could help you but it's gonna involve a number of big steps (yes, I've considered including a tweak to change your old comment picture and name as well). And I'd rather walk you through it, tweak by tweak, instead of giving you a bunch of experimental code. Obviously, this page isn't suitable for a discussion of that magnitude. Here's what I need you to do. Head over to Blogger's official help forum, and post a question there. Once you're done, let me know the link to your question by replying to this comment. Your question need not be comprehensive, as I'll take on it (that is if no-one else beats me to answering you). There's just one thing I'd like to ask you: I've been blogging for years with my blogger account name, which was "Getta". Now that I connected my blogger account to google+, my author name has changed to "Giulia C" (the one you see here). Is your script formatting both Getta's-comments-on-posts-written-as-Getta and GiuliaC's-comments-on-posts-written-as-GiuliaC? 'Getta' was the official author in your blog in the past. Right now, 'Giulia C' is the official author - not 'Getta'. Blogger's has a static field for post authors, which can only accept one author name for a post - even if the names are from the same account. Long story short, the script above will only highlight the current author for each post - past author names will not count, as Blogger doesn't recognize them anymore. Thanks for your fast reply, that's what I was afraid of. So do you think there might be any way to get blogger highlight both names? Yeap, we can get comments from a particular nick to be highlighted. See my reply here. Hi Yoga, how are you? I'm trying to put the code for this blog http://hd-hwld.blogspot.com/ but it doesn't work. Do you mind to have a look? Thanks! I'm doing great. Hope you're doing well yourself..
As for the blog, it looks like a customised template. Is this template based on one of Blogger's default template? If yes, could you leave a test comment so that I can inspect why it isn't working? Good to know that you're fine. I'm doing great too, thanks. Thank you for your reply. You're helpful as always! I've left a test comment. The template is based on Minima. I just made little changes to the date format, additional code for Auto read more and the footer columns. Thanks Yoboy. It works! Thank you, thank you so much. Now, another question, do you have a tutorial that teaches how to show 'Reply', just like your comment here :) Thank you. I don't fine the code anywhere in your blog. You must have forgotten to save the code or something. Try giving it another go, from scratch. Thank you for posting this code - it has been the only one to work for me thus far! However, I have a background image for my comments and when I scroll, the background image disappears. I'm assuming the background isn't "fixed." Is there any way that I could get it to stay visible while I scroll and not disappear (it reappears after I stop scrolling)? Sorry for my ridiculously late reply. I need to have a look at your blog to come up with a possible fix. What's your blog's address? The code worked perfectly on my Simple template. Yet the left border of the coment box is touching my avatar. Here you have A POST WITH COMMENTS so you can see what I mean. Is that something that can be fixed, or do I have to learn to live with it? It there is any other trick that I can use, I'm all ears. If not, thank you anyway. With that last piece of code, the border around my comment completely dissapered, so I removed it. Anything else I could try? That's strange. Could you leave the last code in your 'Add CSS' box and get back to me so that I can inspect your page on what's failing? I did as you told me... and now it looks perfect! It's fixed! No idea what I did different this time (as far as I recall, I did exactly the same the prior time), but it is beatiful. Thanks a lot!!! I can see your comment highlighted. Have you got it sorted? Were there any changes made to the code in your blog? I couldn't see the script in your blog as it is already rendered. Thank you so much for this. I've tried several different tutorials which didn't work but this one did! Looks fabulous! I've just discovered your blog and this tutorial : it works perfectly on my comments, the other tutorials I've tried didn't work at all. Works like a charm mate, thank you. I finally completed this high light stuff ever since I saw your post. thanks, extremely helpful and easy!